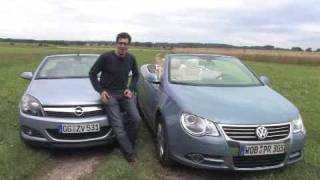 Opel's Astra TwinTop is a classy looking convertible with four-seats and an electro-hydraulic steel roof, making it a more versatible cabriolet than most. It also features a decent engine upgrade, balancing muscular appearance with some real power. The Astra TwinTop is the dynamic, elegant coupé among cabrios. Launched in May 2006, it is one of the first cars in this class to feature an innovative three-part roof system. It opens and closes at the touch of a button in less than 30 seconds, and can be operated while the car is in motion (up to 30 km/h). Thanks to its intelligent, space-saving design, the Astra TwinTop provides passengers more room and a luggage compartment of up to 440 liters. Unique in this vehicle segment is the power operated "Easy Load" system, which allows bulky luggage to be easily loaded and unloaded, even with the roof open. In addition to ESPPlus, one of the Astra TwinTop's standard safety features is the active roll-over protection system. The fully-fledged four-seater is available with five gasoline engines (77 kW/105 hp to 147 kW/200 hp) and the especially powerful 1.9 CDTI common-rail turbo-diesel unit (110 kW/150 hp) with diesel particulate filter as standard. 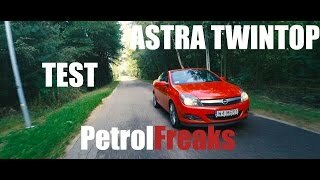 The Astra TwinTop boasts two new, highly efficient 1.6-liter gasoline units in model year 2007, the 85 kW/115 hp and the 132 kW/180 hp engine. Both achieve the balance of more power with lower fuel consumption. For the exterior, the headlamp housings in stylish chrome look also convey an additional sense of quality. The Astra TwinTop Edition, as well as the versions with xenon or curve and cornering light are recognizable by their dark-tinted headlamp housings. Distinctive design elements in the cabrio-coupé's cockpit include the additional chrome rings for the air conditioning and radio controls. The top Cosmo variant features décor trim and inlays made from luxurious piano lacquer surfaces. 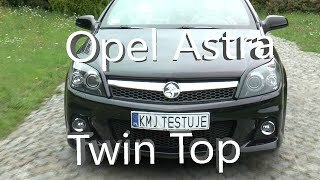 The Astra TwinTop is a slimline four-seat cabrio-coupé almost 4.5 meters long with a wheelbase of 2.61 meters. These dimensions create a spacious interior and enable best-in-class shoulder and knee room. Engineers made this possible through the realization of an innovative three-part retractable roof system. This also is of benefit when it comes to luggage volume, providing an ample 440 liters as a coupé and 205 liters with the top down. The inventive, power operated loading system "Easy Load" makes the trunk easily accessible. At the touch of a button, the horizontally stacked roof parts in the car trunk are raised by around 25 centimeters. The optional leather upholstery in stylish saddle brown look ideally suits the sporty elegant ambience, and is available for the Cosmo variant. The Astra TwinTop features a solid windshield frame and active roll-over protection system as standard. A special sensor in the airbag control system recognizes sudden vehicle turning motions. In the event of an impending roll-over, the control system activates the seat-belt tensioners. Simultaneously, two solid aluminum safety roll bars behind the rear seats deploy upwards and lock tight within 0.2 seconds. The mechanism works with the roof open or closed. The Astra TwinTop body and underbody were reinforced to meet the particular demands of a cabriolet. Opel engineers were therefore able to increase the torsional rigidity that is important for precise chassis tuning. Compared to a similar cabrio with conventional design, an improvement of 30 percent was achieved. Other passive safety elements of the extensive Opel SAFETEC system include two-stage front airbags for driver and front passenger, thorax/pelvis side airbags in front, which also protect the hip area, and three-point safety belts for all four passengers. Active head restraints in front are standard, as are the automatic hazard light function, decoupling pedals Pedal Release System (PRS) and door unlocking after the airbags or seat-belt tensioners have activated. The Astra TwinTop offers top agility and precise handling with high levels of driving safety, the basis for which is the IDS chassis (Interactive Driving System) with McPherson front axle and patented torsion-beam rear axle. Standard safety features in all variants include ESPPlus (Electronic Stability Program), Traction Control (TCPlus), front and rear disk brakes, ABS, Cornering Brake Control (CBC), brake assist, as well as Electro-Hydraulic Power Steering (EHPS). A new dimension of balance between driving comfort and safety is provided by the optional adaptive IDSPlus chassis with electronic Continuous Damping Control (CDC). The system ensures optimal road-holding properties in all driving situations. Owners also benefit from IDSPlus when it comes to driving fun: a touch of the SportSwitch activates the sport mode, resulting in more direct suspension, steering and gas pedal response. The Astra TwinTop's dynamic appearance is complemented by superb driving performance. This is provided by its range of five gasoline (105 to 200 hp) engines with displacements between 1.6 and 2.0 liters, and an especially high-torque (320 Nm) 1.9-liter common-rail turbo-diesel unit with diesel particulate filter as standard. The top-of-the-line engine is the 147 kW/200 hp 2.0 turbo, which enables a top speed of 237 km/h − thanks in no small part to the TwinTop's excellent aerodynamics (cD=0.31). Just as impressive is the new 132 kW/180 hp 1.6 turbo engine with overboost function. 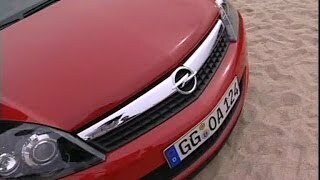 This unit takes the Astra TwinTop from zero to 100 km/h in 9.2 seconds, and to a top speed of 228 km/h, while consuming an average of just 7.9 liters of fuel per 100 kilometers. The 85 kW/115 hp four-valve version with continuous variable camshaft phasing (cam-phase) is more economical still, bettering the 180 hp variant by one liter per 100 kilometers. The turbo engines come coupled with a six-speed manual transmission. The 1.6-liter variants come with a five-speed manual transmission, as does the most popular 1.8-liter engine with 103 kW/140 hp, which is also available with a four-speed automatic gearbox. The Astra TwinTop boasts comparatively low operating costs thanks to the fuel efficiency of its ECOTEC engine range. For example, the 1.9 CDTI requires only 6.0 liters of diesel per 100 kilometers. Customers also benefit from extended service intervals and a reduced scope of required maintenance. Other decisive factors in its excellent total cost of ownership figures include favorable insurance ratings, low maintenance and repair costs as well as a favorable expected resale value. Opel grants a 12-year anti-perforation warranty on the body of the Astra TwinTop. And as with all its other models, Opel offers a two-year new-car manufacturer's warranty for the Astra TwinTop that goes far beyond the mandatory guarantee.